My left quad is still slightly sore from the Bronx 10-Mile, but not sore enough to warrant a day off. So, back to marathon training! This morning’s run felt decent, although the soreness in my left quad held my pace back a bit. I started to find my pace toward the end of the run, but no worries. The first run after a 10-mile race plus extra mileage will likely never feel 100%. Later today I’ll hit the gym for leg and core exercises. And stretching. Lots of foam rolling and stretching! 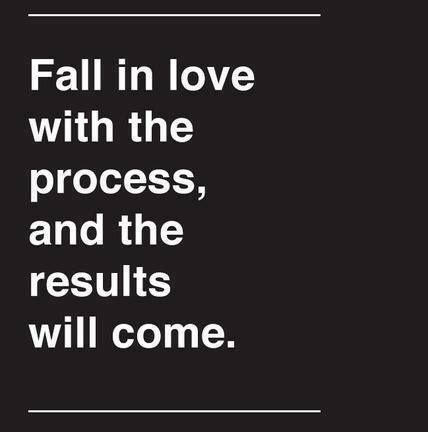 I found an Instagram post yesterday that read “Fall in love with the process, and the results will come.” I really like this sentiment. I found it after reading a couple Bronx 10-Mile race recaps that focused almost exclusively on the runner’s results. My own recap discusses my results (although I tried to recap what the actual race felt like, and attempt to demonstrate my training and race preparation through Time on My Feet). The post reminded me that the most important part of all this racing is the process we runners engage in as we train and prepare. I’ve found that when I make my race results (or results in any area of my life) the only goal toward which I am striving, I tend to attach more value than I should to them. If I attach too much value to them, I let the results dictate my self-worth. When the results dictate my self-worth, they make me anxious. When I get anxious, I become less capable of performing at a high level. When I am less capable of performing, I don’t achieve the results I’m hoping for anyway, which leads me right back into the cycle of anxiety, decreased capability, and underachievement. So, I focus on the aspect of competition that I can control: the preparation. I make a training plan and I stick to it. That doesn’t mean I write the plan on Day 1 and follow every single letter on it: I adjust for fatigue or extra energy when necessary, add races and other events as they come up, and try to live a full life outside of running. I take suggestions from friends and athletes who have trained before me, and am always willing to try new things. I try to share my knowledge with others, and support people who are trying to improve their own running. I hold myself accountable, and don’t blame others when I miss or don’t complete a workout because I didn’t sleep enough the night before. I am ultimately responsible for whether I do the work. If I prepare well, I can stand in the starting corral and feel confident that whatever my race result, I did my best to get to the line. Sure, I might miscalculate something during the race, or maybe I underestimate race difficulty during my preparation. Even so, I can’t devalue my experience because of these missed opportunities. What I can do, however, is learn from the experiences and do better next time. I still enjoy my good results! I enjoy them, however, in the context of my preparation. The most satisfying moments are those when you achieve something, and you can reflect on how hard you worked to achieve it, recognizing your effort and the help you received along the way. That’s how I feel about my results from the Bronx 10-Mile: I worked myself back from injury through physical therapy and a totally new training style, lifted lots of weights and did tons of core exercises, went to bed early and woke up even earlier to keep my training consistent, and I crushed my previous longer distance race paces by over a minute per mile. I say this not because I’m arrogant, but because I know how hard I worked to get to this point. I can pause for a moment of gratitude, and then it’s back to the work. The problem that most people have with training is that training can feel uncomfortable both mentally and physically. Even though I do most of my training runs at a moderate pace, I still feel soreness. I also get mentally worn out some days, and just want the running to end! I’ve learned, though, that there’s joy in fighting through the discomfort. It doesn’t always come instantly in the form of endorphins. Sometimes it hits you when you’re walking down the street and you think, “Hey, you stuck with that workout and now you have nothing to regret.” Sometimes it hits at the end of a race, when you cross the finish line and think, “It wasn’t any one workout that got me here, but those times that I could have quit and didn’t certainly helped.” And finally, it hits you when you realize that you’re building a personal accountability that reflects in other areas of your life, including your work and personal relationships. Fall in love with the process. Every step, every ache, every achievement. Once you’ve got that down, the results don’t even matter that much.